NEHA Tulip Book of 1630 -- a manuscript catalog owned by the Netherlands Economic History Archive. P. Cos Tulip Book of 1637 -- a manuscript catalog owned by Wageningen University. The Great Tulip Book 1640 -- a manuscript catalog owned by Norton Simon Museum. Sotheby�s Tulip Book (date unknown) -- images sold at auction by Sotheby�s. 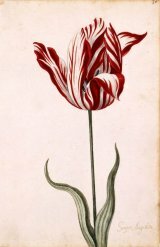 In this section of OldTulips.org, we identify and describe a number of Dutch archival resources dating from the first half of the seventeenth century -- from the time of Tulipmania. We include resources that contain contemporaneous illustrations and descriptive text of tulips then available for sale. These resources are described below. The tulip images in these sources will be found under: Tulip Catalogs Index. The Netherlands Economic History Archive (International Institute of Social History) was established in Amsterdam, Netherlands, in 1914. NEHA acquired the �NEHA Tulip Book� manuscript catalog by purchase, presumably in Great Britain, in 1927. This purchase was one of the catalysts for establishing NEHA�s Book Fund. The cover of the book has annotations from the 20th century which state the tulips were painted by a Dutch artist in the year 1630, and that two separate sheets from 1630 had been purchased by the NEHA Book Funds in 1929. The origin of a third loose sheet was unknown. This book (and three added loose sheets) contain paintings of the tulips in favor at the time of Tulipmania, during the 1630s. The images were created in a variety of media and techniques. The book pages are numbered from 1 to 119, and contain 122 pictures created by Jacob Isaacsz van Swanenburch of Leiden (1571-1638). During the 1620s, he was the first teacher of Rembrandt. To these are added 16 paintings (not of tulips) presumably created by Adriaen Jansz van Witvelt (approx. 1581-1638). Tulips are illustrated in images 3 � 77, in one unnumbered bound image, and in two additional loose plates (80 illustrations of tulips in all). At the end of the book is a note concerning the painters, and how the owner acquired the images. He notes the prices paid to (or at least the value placed on the paintings by) Mr. Jacob van Swanenburch. The original owner notes with great appreciation that 16 pages with paintings of various flowers and insects had been donated to him by a cousin [or nephew] of Mr. Adriaen van Witvelt, and notes the values placed on the images at that time. In another person�s handwriting is added a note stating the work was purchased by that person at an estate acution on January 3, 1637 for �37:0;0�. Names of tulips are given in most cases, but no weights or prices are recorded. In fact, these works were created six years before Tulipmania began to reach its zenith in December 1636 and January 1637, Thirty-two images of tulips are unnamed. Many images are of the flower only -- no leaves or extended stem. Those images are arranged on the page, with the name near the bottom, as to suggest that the foliage and stem were to be �painted in� later. It was common practice for the �master� to paint the more difficult and detailed portions of a painting, and for his or her apprentice painters to fill in the larger arrears or less significant portions of a painting. These images are an important example of this process. One image (Unnumbered image 15) consists only of a faint charcoal line drawing of the flower, which would have been painted in by the �master painter� later � but was never completed. In some cases where the stems and leaves have been added � essentially completing the image � the additions were poorly painted, and obviously without looking at the flower itself. The Wageningen UR (University & Research Center), a public university in Wageningen, The Netherlands, has a staff of 6,500 and 10,000 students from over 100 countries. It has strong programs in the areas of Food and food production, Living environ, and Health, lifestyle and livelihood. Its library has an excellent collection of current as well as archival resources. 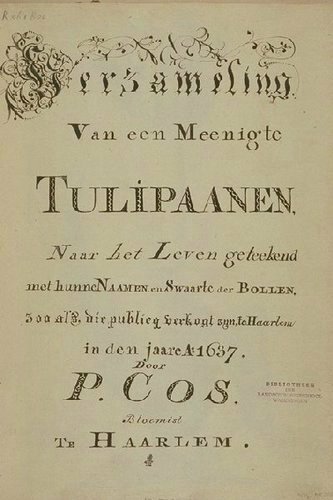 One exceptionally significant archival resource is The Tulip Book of P. Cos. The following information about early publications on tulips and the �P. Cos Tulip Book� are adapted from Tulip, which appears, on the Wageningen UR (University & Research Center) Library website. It has been slightly shortened and edited for inclusion here. �In the entire world, 43 tulip books are known to exist. They are all manuscripts, made by different illustrators, and therefore each is unique. �Of these books, 34 were made in the Netherlands during the first half of the seventeenth century. This period saw a rapid development of the range of cultivated tulip varieties. 'Broken' tulips, showing a feather or flame pattern, were all the rage. We now know that these patterns were the result of a viral infection. Speculation rose in the year 1637 to an extent that bulbs were sold faster than they could grow. �Prices spiraled to a ridiculous level for bulbs of which neither buyer nor seller had seen the flower. This Tulipomania got out of hand so badly that bulb growers themselves asked the government to ban the trade. Click image at right for a larger version. �This book was part of the Krelage Collection. This former private library also contained numerous tulipomania pamphlets ridiculing the craziness of this speculative trade. �The manuscript contains 54 gouaches of tulips, followed by 12 added drawings of tulips some by [Pieter] Holsteijn the Younger and Pieter Schagen, 7 watercolours of carnations and 2 drawings of other flowers. The beautiful photographs of these manuscript pages will be found on the University Library website at: P. Cos Tulip Book. On the University Library website, you can leaf through the book, view a contents page, and watch a slide show. 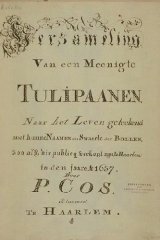 Tulip Catalogs Index provides a list of all tulips included in the P. Cos Tulip Book along with selected text that appears in the corresponding images. This text has been translated into contemporary Dutch and then into English by Marco Schuffelen, founder of the �Learn Dutch� website. Tulips with known names have been arranged in alphabetical sequence by contemporary name and spelling, followed by the name as spelled by P. Cos.
All the tulips in the P. Cos Tulip Book are extinct, with the exception of two which are so noted. 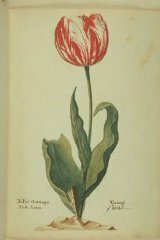 A number of the images from the Great Tulip Book have been reproduced and are for sale from the Norton Simon Store. These images will be included in the following Extinct Cultivar List, along with translations of inscriptions on the images. The mages will link back to the Norton Simon Store, making it convenient for persons to purchase copies, if so desired. It is hoped that with time, all the images from the Great Tulip Book and corresponding information about the tulips can be added to this website. The images from this source were sold at auction by Sotheby�s, but provenance not yet determined. We link to the images on their website. We will add more details about this source later.